In the world of audiovisual tech, the receiver sits at the head of the proverbial table. Yes, we need TVs, speakers, streaming devices and game consoles, but without a powerful AV receiver to hook everything together, our audiovisual experience would be half of what we’d expect. 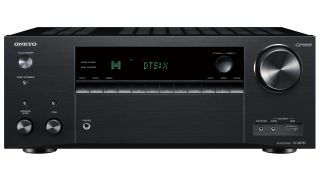 Knowing this, Onkyo has loaded up its 2018 flagship receiver, the TX-NR787, with some truly mind-blowing tech, including Dolby Atmos and DTS:X support, Dolby Surround and DTS Neural:X up-mixing, HLG (Hybrid Log-Gamma), HDR10, and Dolby Vision support and three zones of audio. According to its specs, its base configuration is a 9.2-channel receiver but supports a 5.1.4 Atmos configuration with a massive 220-watts per channel. It sports seven HDMI ports at 4K/60, plus passthrough for HDR10, HLG, Dolby Vision, BT.2020 and HDCP 2.2. It comes with Chromecast built-in, but out of the box supports DTS Play-Fi, AirPlay, Amazon Music, Spotify, TIDAL, Deezer, Pandora and TuneIn, plus 32-bit DSP. New for this year is AccuEQ Advance, a new premium multi-point room-acoustic calibration system that eliminates standing waves that uses three locations in the room to balance sound. Considering everything Onkyo packed inside of it, its price is surprising: it’s just $799 (around £589, AU$1,059). One of the biggest strikes against AVRs in the last decade has been the popularization of the soundbar, which offers a quick and easy way to enhance audio quality without dealing with speaker wires or separate audio cabinets. And, for a certain audience, that’s absolutely fine.